Both the Masons' Society and Journeymen House Carpenters employed public rhetoric which explicitly grounded their workplace demands in their desire to champion family breadwinning and family leisure time obligations. The fact that organized working men overwhelmingly self-identified as household providers meant that such rhetoric should not be viewed as empty sentimentalism, but rather as central to their attempt to fulfill domestic identity. While Section Two probed a variety of economic institutions and other workers that organized men perceived as threats to their household-based masculine responsibilities, this chapter begins Section Three by examining the way that working men responded to such potential threats by collectively organizing into trade unions in order to protect their position as breadwinners. Working men's multi-layered breadwinner ideology included the obligation to care for their household dependents materially and mentally. This meant that journeymen both needed to earn enough money in the workplace to support their families' domestic needs and to secure enough time outside the workplace to properly oversee and govern their families' progress.5 While individual men felt the pressure of upholding their household-based masculine responsibilities, they found it almost impossible to address these issues on their own, so they sought collective action—in the form of trade unions—to assist them in providing for and maintaining their domestic role. As the actions of the Masons' and the House Carpenters' Societies demonstrate, organized men defended their decisions to stand out from work by informing the public of their breadwinning responsibilities and the actual monetary difficulties they faced. Significantly, their household budgets included both family obligations to be satisfied by pecuniary means (rent, provisions, etc.) and family obligations to be satisfied by temporal means (retirement, not working on Sunday, etc.). This chapter analyzes organized New York working men's breadwinner ideology and demonstrates how breadwinning concerns grounded trade union rhetoric in a number of discursive arenas during the early nineteenth-century labor movement. Because this ideology developed within a milieu where women's work was either unpaid or underpaid because of the assumption of women's performance of domestic labor, scholars writing on the creation of early republican breadwinning have been eager to determine breadwinner ideology's effect on single working women and the wives of working men. So, much of this discussion has focused on how men used new industrial conditions to limit opportunities for women or on female attempts to resist or break apart the artificial classifications between the worlds of breadwinner (paid) and dependent (unpaid) labor.6 While organized men did occasionally use this rhetoric to argue against perceived threats from female workers, these examples pale in comparison to the way trade unions utilized breadwinning discourse to protect and maintain conceptions of ideal household-based masculinity. As this routine changed and fewer journeymen artisans could afford to become masters, a proliferation of married journeymen-for-life sought a new way to establish themselves as economically independent.9 In this new economic arrangement, male workers championed economic independence solely through breadwinning and household authority—albeit connecting outside-the-home work experiences with domestic obligations—rather than traditional practices which consolidated workplace and household mastery.10 This gradual process varied in speed and scope depending on the nature of individual crafts, but in New York City, it generally concluded by the first half of the nineteenth century.11 An 1836 report to the National Trades' Union even concluded that a "workman" was "the parent, the husband, or the brother," whose support kept "his wife or relative at home, to perform the duties of the household. "12 As a new model of household-based worker masculinity emerged between 1800 and 1840, breadwinning ideology gained prominence. This picture of a typical journeyman cordwainer's existence clearly demonstrated the importance of breadwinner ideology to trade union rhetoric. For the cordwainer, a family to feed and educate in the domestic realm was as vital a component of the performance of his manly workplace duties as a hammer and a leather apron.14 There was no perceived separation between his duties stitching leather and his duties feeding and educating his family. So, even though market developments physically divorced the home and work spheres for journeymen, the interconnectedness of domestic and workplace obligations kept the spheres united.15 Upholding both of these responsibilities allowed journeymen who could not become economically independent masters in the workplace to fashion a new version of economic independence in the home as a breadwinner. While this ideology limited women's public economic role, artisans' wives almost universally supported the notion that husbands publicly engaged the economy on behalf of the household.16 Martha May effectively argues that during the nineteenth century, artisans' wives predominantly buttressed the trade union assertion that husbands were the family's primary providers.17 So, no matter how much money women contributed to the family budget, men always claimed the right of first refusal on the independent breadwinner label because they considered the amount of the financial contribution less important than the type of financial contribution. The story of Elizabeth Kline, mentioned in Chapter One, is telling in this respect. Even in a public document asking the Common Council to allow her to act as a financial agent by selling coffee during her husband's period of unemployment, Kline defended her husband's right and duty to perform as the family breadwinner. New conceptions of the relationship between domestic masculinity and the workplace did not, however, automatically result in rosier economic prospects for journeymen. Skilled craftsmen and their families usually lived outside the realm of extreme poverty, but they could not hope for much in the way of savings or luxuries. One reason for their predicament was that the economic advancements of the market revolution did nothing to resolve the high inflation for household expenses. This period saw the construction of the Erie Canal and other transportation improvements that allowed merchants and manufacturers limitless business opportunities, but drove down wage rates.21 Expenses for a journeyman's family of five or six often surpassed the income he could generate in the boom-and-bust cycle of craft production. While married journeymen managed to persevere when the economy flourished, financial downturns spelled unemployment and disaster. 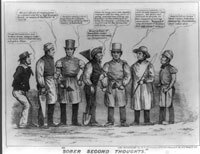 Artisans Dressed For Work A political cartoon entitled Sober Second Thoughts, sketched during the Panic of 1837, illustrates this situation. Along with a group of dispirited working men, a metalsmith, third from the right in a top hat, noted that "I have for many years been steadily employed at $2 per day, until recently, and now am told by my Employer that he has nothing to do & I am discharged; and how I am to get bread for my family I do not know. "22 The simple sentiment expressed here hit home, literally, for journeymen: mind your economic decisions during prosperous times, because circumstances can change quickly and your family will still need your support. One popular contemporary treatise on household economy lamented that a "married man has no right to expect the same plenty of food and of raiment that the single man has. "23 At moments of crisis, trade union rhetoric specifically addressed breadwinning ideology and its importance to organized men's economic position. Family sacrifices (even at the expense of a union working to help provide for that family) were just as common a generation later when H. D. Bristol, the acting President of the Typographical Society, resigned his position in a letter sent from upstate. Bristol wrote that he needed to step down because "circumstances of domestic and pecuniary affairs" prevented him from doing his job.27 Although Bristol's activities in the Society began many years earlier and he rose to its highest office, he chose to leave the organization rather than abandon his household obligations. Such examples show that even among trade union members, support for breadwinning ideology could be demonstrated in a variety of ways. It is therefore important to remember that a simple, causal link did not exist between labor organizations and breadwinning ideology, but rather the relationship was part of a series of connections between household-based masculinity and the workplace. In order to see what such connections meant on the ground level of labor organizing, it is useful to look at the Journeymen Cabinet Makers' Union's 1835 strike. Builder—Good morning John, I want you to go to work for me, and to remain in my employ all summer. John—How much do you calculate to give your men this summer? B.—Fourteen shillings, I think that is a very good price, and ought to satisfy you. J.—I do not consider it a good price at no time, more especially now, when every thing is so high.—How do you think a man with a wife and six children can live on 14s. at the present rate of rents, fuel, provisions, &c.? B.—I am aware that a family cannot have many of the luxuries of life on that income, but that is more than you have sometimes had, and many support families on much less than that. J.—To my sorrow and regret I know too well, that myself and too many more, have spun out a miserable existence for want of compensation. To support a family of eight persons with any thing like comfort on 14s. is entirely out of the question. Mechanics and laborers know little or nothing about comfort, so far as their physical wants are concerned. You bosses who live in good, if not splendid houses,—[dine on] beef, turkies [sic], celery, and all the delicacies of the market; have no conception how the men in your employ live, exist I ought to say—live they do not comfortably. J.—I shall not work for 14s. at present, I cannot afford it, it would not be doing justice to my family. The working mechanics have suffered privations and degradation too long, and they are now determined to make a bold and manly effort to better the condition of themselves and their families. I cannot see any good reason why, the men who do all the labor should not live as well at least as those who do not labor. While probably a bit overstated, the dialogue between John and the master builder demonstrated how differently each interpreted a breadwinner's needs and domestic responsibilities. John clearly expressed that he could not pay for his family's expenses in the summer of 1836 on only 14 shillings ($1.75) a day. John's intention to not work in the name of upholding his domestic responsibilities spoke to a definition of breadwinning that differed significantly from his employers. Organized working men's breadwinning ideology did not try and emulate middle-class respectability; it tried to keep pace with journeymen's lived experiences and the demographic realities of their households. Given that the article in The Democrat ran only a few months after the Great Fire of December 1835, which made rents rise 100% and sometimes 200%, it seems likely that John's point about current high prices was well founded.39 The master builder assumed that some money was better than no money, even if it only afforded John and his family an uncomfortable lifestyle inferior to his own. However, for most workers, this was not a solution. Just a few months later, labor leader Seth Luther summed up the problem during a speech in Brooklyn, noticing that "those who build houses in these days have none of their own. "40 Skilled workers such as John did not claim to want their bosses' wealth or luxuries, only to support their families in a modest comfort. Journeymen at the time referred to this outlook as breadwinning "competency. "41 The idea, expressed by the master builder in the dialogue, that some men deserved a better version of competency than others contributed to journeymen's wage stagnation even as living expenses rose. In order to expose this double-standard and obtain real breadwinning wages which kept pace with inflationary household expenses John, like the House Carpenters' Union cited above, utilized tangible family budgets in their strike appeals, to appeal to the public's sense of fair treatment. Organized men looked to their fellow unionists for financial and moral support during periods of illness. Internal discussions from a number of different trade unions cite the distribution of sick payments as one of the primary benefits of union membership. Through such dispensations, early craft unions functioned as mutual benefit societies at the same time they enforced price lists and struck for higher wages. Organized men took such benefits seriously and many individuals probably joined trade unions just to ensure some form of family health insurance. In these years, craft-based benefit societies offered one of the only means for a sick journeyman to replace money lost due to poor health. When a union member took ill, the society sent a committee to verify the condition of the member and determine his family's economic need.48 If the household demonstrated need, the committee decided on a plan of action. In the August 1816 case of sick printer Peter Riley, the Visiting Committee reported to the Typographical Society meeting that Riley, "a member, was sick - [and] the sum of three dollars was awarded him, and a draft was made upon the Treasurer. "49 The three dollar award accounted for only a few days' wages, but in Riley's case this allowed his family to buy a week's worth of food. For a sick union member, the acceptance of financial backing at a time when circumstances out of his control threatened his role as the independent head of the household allowed him the opportunity to reestablish his breadwinning position later. Healthy organized men likewise buttressed their own breadwinner ideology by supporting fellow union members in order to reinforce the notion that journeymen could support their own families without charity or degrading their craft position. The address cited the understanding that journeymen self-identified as parents whose primary responsibility was to labor in order to feed and comfort their family. Asbridge built on this portrait to directly relate the ability of a sick journeyman to recover from illness and resume his household-based masculine duties as family provider to payouts from the Typographical Society. In this capacity, the union not only rhetorically urged its members to fulfill their breadwinning ideals, but also acted monetarily to facilitate the process. It was not just an injury or accident on the job that could threaten a workers' breadwinning ability, it was the everyday grind of harsh, manual labor which eventually took its toll. The artisans who formed labor unions took pride in their craft skills (as shown in Chapter Four), so they were not likely to come out and explicitly indict the trade for sending them to an early grave, but various third-party reformers cited the perilous conditions that journeymen experienced on a daily basis. One article noted that bakers worked "from 110 to 120 hours per week, and sometimes 24 hours without cessation … in consequence of which their constitutions have been destroyed, and they have prematurely become tenants of the alms house or potters' field. "58 A more scientific sounding warning came from the Journal of Health, which published an article on the "diseases of artisans" which included a section on stonecutters. It warned that these men suffered "by inhaling the volatilized particles given out in cutting and quarrying stone; and if they continue persistently at this kind of work, they fall victims to sundry diseases of the lungs, before they have passed the maturity of life. "59 With such dire predictions, labor organizations eventually branched out from immediate household aid to more long-term contingency plans. Journeymen's concern for upholding their household breadwinning duties even after their deaths also motivated the organizational rules that bound union members together. The Constitution of the New York Journeymen Shipwrights' and Caulkers' Society contained an article declaring that "on the death of a member, the President shall cause the Stewards to invite the Society to attend the funeral. The Standing Committee shall inquire into the circumstances of the family of the deceased, and if they are found necessitous, shall report them as such to the Society. "62 The provision highlighted one of the fraternal aspects of early unionism by compelling organization members to attend a fallen brother's funeral, but more importantly the rules protected breadwinning ideology by enlisting union resources to ensure his family's comfort. For the Journeymen Shipwrights and Caulkers, such articles proved to be more than rhetoric; the Society repeatedly invoked constitutional procedure when organizational affiliates passed away. Between May 1815 and June 1818 more than ten members passed away and the union's minute book noted the support of several deceased members' families, including a payment on October 12, 1815, of "$9 for the widow Mills." 63 A few years later, the union's account book recorded that "Widow Catherine Dunn" was "pensioned on August 19, 1819 by treasurer paid in two installments for the year on May 19 and November 19 at $17.50 per payment. "64 As they did with sick benefits, union committees subjected death benefits requests to review in order to prevent abuses. Demonstrating that the union's benefit review mechanisms worked properly, the November 19th payment to Catherine Dunn marked exactly the one year anniversary of her husband Abraham Dunn's death.65 Even after breadwinners died, labor unions worked as their agents to help provide support for their families. Journeymen, whether healthy or sick, did not always enjoy their employment; nevertheless, survival and economic household obligations required that when they could find employment, they worked. The only time skilled artisans collectively chose not to work was when they gambled that a short-term strike would yield long-term benefits for themselves and their families. However, even in the years before trade unions secured legal protection, thousands believed in the necessity of such risky ventures.66 Some contemporary critics chastised striking journeymen as selfish and irresponsible for choosing not to work even for one day when their families exhibited need. Like other aspects of the labor organizing and breadwinning, such controversies often turned on issues of manliness. Cartoon Comparing Striking Unionists to Farm Animals Who Won't Work When the Journeymen Tailors' Union turned out for better breadwinning wages in 1833, the Journal of Commerce questioned the validity of a strike and whether proper husbands and fathers would act in such a way toward their hungry families. The tailors simply responded that "we consider ourselves too much the 'the man'" to give any credence to the Journal's insults.67 Whatever difficulties striking families endured, the tailors and other organized men felt justified that they acted to uphold their model of household-based masculinity. More often, well-wishers offered non-monetary support. The Typographical Society wrote a letter to the striking Cordwainers' Union to express their "good wishes" and blessings for the "success of their cause," but they could not help with a financial gift due to the "recent exhaustion of [their] own funds in assisting [their] own members who had stood out for wages. "69 Before the mid-1830s, inter-union correspondence commonly conveyed such sentiments. Individual trade unions frequently did not have the financial apparatus or the infrastructure to pass along donations, but doubtless they would have forwarded the aid to their comrades if such mechanisms existed. Inter-union relations changed dramatically in 1833, when the creation of the citywide General Trades' Union Convention pooled individual organizations' disparate funds together and increased strike benefit payments for workers' families. Founded "for the purpose of self-protection," the GTU grew out of an impromptu but concerted effort by journeymen of many craft backgrounds who "determined that they would aid" striking house carpenters.70 The monetary benefit of a collective approach to strike benefits literally paid off, spawning the GTU. It is important to understand that it was the mechanism of better coordinating strike benefits to breadwinning working men and not any new particularized class movement that spurred the creation of the GTU and the mass trade union movement of the mid-1830s. Strike benefits, like sick or death benefits, crucially enabled domestic survival because they enabled organized men to maintain their capabilities as family providers while they engaged in activities that temporarily threatened their ability to maintain household obligations. While the availability of strike benefits influenced the circumstances of collective action, it also contributed to trade union attempts to prescribe members' behavior. Strike guidelines in internal union documents, such as Constitutions and by-laws, not only explained the benefit dispersal process, but also tied the system to particular behavior for worthy striking men. The clearest example of this comes from the Typographical Society's Constitution: married striking members received $4 a week, single men received $3, and by-laws compelled active labor from payment recipients to ensure that such benefits provided only temporary support. Printers "thrown out of employment in consequence of not obtaining a price for his labor that shall be in accordance with the scale" could receive benefits only as long as they made an "effort to obtain another situation" and had not refused "honorable employment. "74 Similar by-laws attempted to regulate other types of working men's behavior to ensure that the union only financially supported legitimate breadwinners. Because of its attempts to ensure a citywide closed shop, the Cordwainers' Union's behavior policing also extended beyond the current membership to those journeymen who might become future unionists. Outworking cordwainer William Dougherty was not a union member during a short turnout in October of 1811, when he labored "for a livelihood for himself & family," but still faced a union reprimand when he tried to join the organization a couple of weeks later. According to Dougherty's official complaint, the union asked him to pay a fine for bucking their rules about working during a strike and when he refused, he was "excommunicated from the Cordwainers' Society. "77 Whether or not such coercive methods altered anyone's behavior is unclear, but various trade unions' commitment to such strict standards reinforced the importance of breadwinning and strike benefits to trade union activity. While the dispensation of sick, death, and strike benefits provided a source of public pride for union members, vigilance against the corruption or waste of benefit money peppered union by-laws and internal debates. Unionists favored breadwinning ideology and acknowledged the importance of supporting members' wives and children, but deciding who was eligible for whatever meager funds could be raised posed more difficult problems. Given the pittance that most labor organizations mustered for benefits (especially before the creation of the GTU), debates surrounding even the smallest of pecuniary outlays took on vital significance. Typographical Society minutes during these years show a number of conflicts concerning benefit eligibility. Strict guidelines about membership and behavior often required tough decisions and the centrality of breadwinning ideology to these organizations merely complicated matters. Even though fellow journeyman printer James Findley, "was reported to be sick, and himself and family in great distress, [t]he Board did not consider him entitled to the privileges of a member" because he had not followed their guidelines; nevertheless, certain members did pity his family and "threw in their mite for his relief. "78 The Society certified Henry Back as a member, but after he took ill and decided to recuperate in "the southern clime," they would not guarantee benefits for his wife and children, who remained in New York.79 Although he protested and a month-long dispute ensued, the Society eventually stopped all payments to his family. Upholding breadwinning as a vital part of household-based masculine duty required more of trade unionists than merely providing financially for their households; ideal breadwinners also secured enough hours outside of work to spend quality time with their families. While ensuring that their families had enough money to survive was of primary importance, journeymen breadwinners' duties did not end there. Organized men expected to take an active role in overseeing their family's moral, spiritual, and emotional lives and struggled to secure enough time to do so. This did not mean slacking in the workplace; rather it meant trying to achieve a balance between time on the job and time reserved for the family. Journeymen did not uniformly pass time away from work and debated how to best spend their domestic leisure hours, but they never questioned that family time was one of their household obligations. It was therefore not strange that the same Masons' and House Carpenters' strike manifesto budgets which sought better breadwinning wages made sure to specify that unionists treasured their Sundays off of work and that they needed to save some money for "the maintenance of old age. "83 Working men did not assume that retirement and family time during evening hours and Sundays was a luxury, but rather a necessity for fulfilling breadwinning ideology. Alongside unions' public rhetoric and private discussions arguing for pecuniary breadwinning, another discursive strain of breadwinning sought a shorter work day and promoted spending time with the family. How many hours did a skilled journeyman work and how many how hours did he spend with his family in the first four decades of the nineteenth century? The question is simple to ask but difficult to answer simply. Like other aspects of workplace custom and regulation among craftsmen, significant variation existed between trades and decades. In the colonial era, journeymen and master artisans often worked side-by-side with the day's length set by individual masters based on the number of local orders.84 As amplified production separated masters' duties from journeymen, workday standards increasingly came under the purview of citywide craft regulations. Masters' organizations and journeymen's unions constantly debated the issue over the years, with many workers achieving a maximum ten-hour day by the second decade of the century. Such examples point to the ongoing workday negotiation underway in these years, whether bosses expected nine, ten, or fourteen hours of labor. Bosses eventually took measures to eliminate middle of the day distractions and increase the amount work performed.91 Negotiations to change the flow of the workday did not always go smoothly. Journeymen shipbuilders in Thacher Magoun's employ struck in 1817 when he tried to end periodic drinking breaks in order to prevent drunkenness and get more labor out of his workers. Working men referred to the drinking breaks as "luncheon times" and usually used the time to consume food as well as liquor.92 The strike was less about resisting the extra work as it was about an attempt to show Magoun that journeymen shipbuilders' vision of the workday included a certain balance between activity and leisure. As household providers, organized men conceived of their time commitment to their families as a crucial component of upholding breadwinning ideology. Achieving a ten-hour or nine-hour workday was not an end unto itself. In both public rhetoric and internal trade union conversations, journeymen paired workplace demands with discussions citing the importance of domestic leisure time pursuits. Such activities included using time to study by themselves or instruct their families about proper morality. The National Trades' Union urged its readers to use their "leisure hours" wisely and concentrate on "the study of useful books" in order to help prevent their own and their families' decent down "the paths of profligacy and vice. "96 Many apparently took the advice. One English observer wrote that for New York's working families, "reading," as well as "singing hymns and psalms, constitute the evening's amusement. "97 Similarly, the minutes of the New York Typographical Society show a suggestion by the Committee of Vigilance to establish a Literary Club "for the encouragement of literature. "98 Organized men seeking improvement could certainly have used a place to appreciate literature and study, but as pro-labor newspapers continually stressed, such advancements did not mean much unless breadwinners also transmitted them to their family. An article entitled, "Family Government," reminded fathers that the best thing they could do for "their own families and the community at large" was to "devote the evenings to their children. "99 Such prescriptive advice was easier said than done for organized men, who could only manage to spend a limited amount of time at home with their families during the taxing work week. While retirement sounded enticing, providing for current family needs while working was usually all journeymen could afford. This position led House Carpenters to ask in their 1809 strike manifesto, how are "fathers of families to judge what will be the amount of the surplus [of their wages] for the maintenance of old age? "102 Financial difficulties aside, artisans saw retirement as the ultimate reward for a career of successful breadwinning, when they would have a glut of time set aside for husbands and fathers to do what they pleased with their families. The same aspects of household-based masculinity that provided an impetus for economic independence and subsequently led breadwinning journeymen to strike for higher wages also guided their desire for temporal independence. Organized men argued that it was "of vital importance to ourselves, our families and our children" to able to "dispose of our own time in such quantities as we deem and believe to be most conducive to our own happiness. "103 While it seems reasonable for journeymen to demand control over their lives outside of the workplace, bosses viewed such rhetoric in a very different light. Master craftsmen realized the important relationship between their workers' desire for independence of leisure and independence of economics. So, while workers perceived the two points as interlocking aspects of breadwinning ideology, their employers regarded the argument as a threat to their control of production and workplace organization. Bosses fought such developments vigorously. Along with their anticipated resistance to requests for shorter workdays and higher wages, employers attempted to restrict employees' non-work activities. One of the most successful ways to do this was to get journeymen and their families to use Sundays for spiritual pursuits, rather than "scandalous" leisure pursuits. The number of journeymen artisans that favored temperance and spending Sunday in the Lord's service in this period is difficult to calculate. Most likely some small percentage of organized men actively supported evangelical causes, another small percentage actively supported free thought and secular causes, and the mass in the middle considered themselves culturally Christian (whether Protestant or Catholic), but did not spend much time in church.107 Rev. Isaac Hecker, who along with his brothers John and George, joined the Loco Foco Party when he was just a teenage baker, later noted that "many of us had not any religion at all. "108 Whether or not organized men advocated religious causes was not material to many journeymen; most organized working men simply wanted to make their own family's decision about how to spend their Sundays. As breadwinners, working men accepted that family time could take either a spiritual or a non-spiritual form, as long as the ultimate decision rested with the head of the household and not with an outside force. So, when Robert Rantoul Jr., in an Address to the Workingmen of the United States of America reminded journeymen to "make good use of your Sundays," he did so only after declaring that "our time then is our own. "109 The right of self-determination over one's household was so central to breadwinning ideology and skilled journeymen's position, that even the American Tract Society acknowledged it in a pamphlet meant to bring working men and their families into the evangelical fold. In Saturday Night, two skilled mechanics discussed their plans for the upcoming Sunday over the pay table. Robert Wise noted that he has "a wife and family to provide for at home" before detailing his Sabbath activities. He boasted that "the children [will be] all clean, wife ready with the breakfast; and as soon as that is over, we prepare for family worship . . . the little ones all join—I set the tune, and my Sarah has got a pretty voice. "110 Across the table, William Ready offered a very different proposal for the day off. He and his wife, along with two other couples, were planning a "pleasant party, to take a little recreation on the water. "111 Ready eventually abandoned his scheduled activities, but not before Wise appealed to the breadwinner in him, reminding him that after the Sunday boating trip he would return home, "money all spent—wife perhaps out of humour [and] the children cross and sleepy. "112 Far from the world of labor actions for higher wages, this example shows how central breadwinning ideology was to working men's household-based masculinity by providing economically, temporally, and even spiritually for the family. The connections between home and work and the importance of breadwinning also permeated A Dialogue Between Strike and Steady, Two Journeymen Tailors, In Relation to Trades Unions, Etc., an anti-union pamphlet that appealed to artisans in the mid-1830s. Set in the homes of the two tailors, the men, their wives, and even sickly children partake in discussions concerning labor organizing, drinking, and providing for family obligations. Steady, a nonunion tailor, tells his union neighbor Strike that labor organizing is responsible for "leading men to the dramshops" and that all journeymen's household budgets would be met if they lay "off drink. "113 Strike eventually heeds the message, due mostly to the fact that Steady always provides for his family comfortably, while Strike's own household suffers. By the end of the pamphlet, Strike acknowledges that he is "half sorry I ever joined" the union, while Steady's "good wife here has often fed my children, when their poor mother was starving at home in tears. "114 The dialogue closes with Strike's own unnamed wife thanking Steady for restoring "a husband to his wife, a father to his children, and a man to his senses" and a closing comment from Strike that, "man and wife is union enough. "115 Because journeymen's wives' voices are noticeably silent in printed labor materials, her statement is particularly poignant. The message of the anti-union pamphlet is clear: if you really want to provide for your family, you need to work harder and not engage in labor organizing. The subtext of the message is also clear: whether you are a sober evangelical or a hard-drinking free thinker, the real reason for working hard is family breadwinning. Although anti-union forces, rather than organized working men, wrote the previous dialogue, the authors correctly appreciated how a tract discussing proper breadwinning hit at trade unionists' core issues during the 1830s. The pamphlet synthesized master artisans' gloss on their employees' breadwinning concerns and the language they used to express them. Such things would have been easy for bosses to learn. Breadwinning rhetoric dominated labor discourse in a number of public forms including newspaper articles, speeches, court proceedings, pamphlets, and tracts and throughout different artisans' trades: tailoring, carpentry, printing, cabinet making, ship-building, baking, and shoemaking. Organized men did not alter their championing of breadwinner ideology when they spoke amongst themselves within internal trade union meetings. The claim that organized journeymen adopted breadwinning language as mere rhetorical flourish to gather public support, then, does not bear close examination. Journeymen systematically supported breadwinning ideology as an integral part of their household-based masculinity and not simply through a hodgepodge of isolated anecdotal incidents. As this chapter demonstrates, organized men identified a complex range of breadwinning obligations as central aspects of household-based masculinity and when confronted with a series of potential threats to upholding their domestic duties, used the collective strength of the labor movement to help them provide materially and mentally for their households. A very tangible, overarching concern for satisfying family responsibilities united the efforts of journeymen in strikes for higher wages (or to prevent pay cuts) and shorter working hours. For working men in the early nineteenth century, such responsibilities included earning enough to support a comfortable household budget and securing enough time outside work in the evening and on Sunday to oversee family governance.